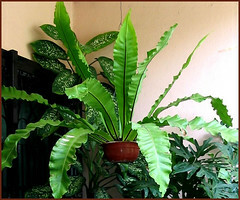 Enjoy Asplenium nidus (Bird’s Nest Fern) with least care! 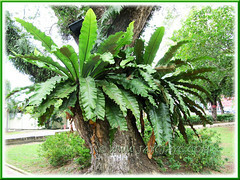 Plant type: A large evergreen stemless tree fern growing as a rosette with ornamental foliage. Soil: Best in well-drained soil mix! Recommended is a soil mix of peat moss, loam and sand. Propagation: By dividing the root ball or by spores. These linear spores (sori) develop on the underside of their fronds extending from the midrib. Here’s an interesting article by Keith Rogers on fern propagation by spores. 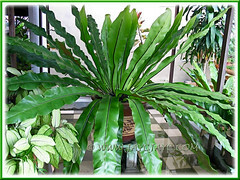 Features: This evergreen fern, Asplenium nidus can grow quite large in a rosette shape, reaching almost 2 meters in diameter with fronds radiating from the base center. Their lovely bright apple-green fronds measuring 2-4 feet long and 3-8 inches wide are smooth, glossy and acuminate at both ends. 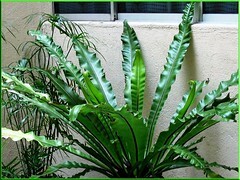 Fronds are mostly crinkled and erect, but arch outwards and has a dark-brown or black midrib as it ages. 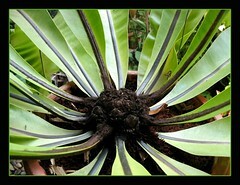 These fronds rising from a crown with a central hollow will eventually resemble a nicely shaped bird’s nest, capable of catching falling debris. 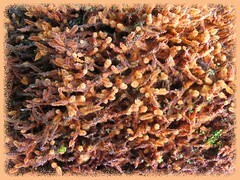 It has a small root system which is dense, spongy and covered with brown root hairs. Usage: It’ll make a wonderful centerpiece in any garden decoration, whether planted in a pot, container, hanging basket or even on ground. Excellent as an accent in any landscape or rock garden. Being an epiphyte growing on large trees in the rainforest, parks or along roadways, it can be cultivated on trees growing in one’s garden to enhance the garden view. Care: Quite easily maintained with minimal care! All it need is enough filtered sunshine and watering, as well as monthly fertilizing which is optional. Do give an occasional shower of their fronds to keep them healthy from dust and retain their apple green sheen! Remove old, brown and damaged leaves at base to maintain their loveliness. And watch out for slugs! 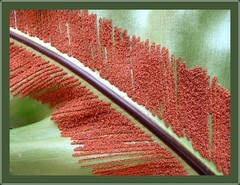 Equip yourself with more plant care info, just in case your bird’s nest fern faces these physiological, bacterial and other related problems. For temperate regions: Check this site for additional information. Anyway, we’ve been most fortunate to find some bird’s nest fern sporelings (3 of them actually, the size of my palm) growing in the cracks of a large drain outside our front yard, maybe 6-7 years ago! And of course, we gleefully added them to our garden family, joining the busy crowd of green foliage plants that we enjoy having! Adiantum latifolium – free tropical ferns for life! This plant is wonderful “bang for the buck”, being inexpensive, not really that difficult to care for, providing large, lush foliage, and is versatile in display. It is great for condo and apartment dwellers who need shade or privacy and have nowhere to put a large number of pots. A homemade rustic bamboo trellis is nice and can display these plants at different heights for a “green wall”. If grown as a hanging specimen, e.g. 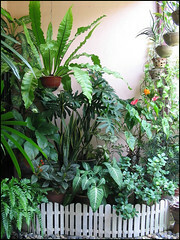 on a balcony, then do be diligent about checking soil moisture, as a 6-8″ hanging pot on a balcony will dry up in a couple of days in hot weather, and like most ferns, they dislike losing moisture. It’s good to have an anchor of strong wire (that can be hidden) to secure them firmly, as these plants can be quite aerodynamic in windy weather! Only to be told that they were actually “planted” by the Chief Gardener, Mother Nature herself. Thanks for your much appreciated additional info, Lifera… especially helpful for condo and apartment occupants. 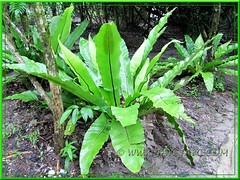 Where can I find the place to purchase the bird’s nest fern/crow’s fern?